Here is a really big "Uh Oh!" moment if you take birth control pills and live in the US. Yesterday Pfizer announced a voluntary nationwide recall of a million packets of birth control pills. Some packs of birth control pills were released with an inexact count of inert or active ingredient pills or with out of sequence pills. With the knowledge of the FDA (Federal Drug Administration), 14 lots of Lo/Ovral®-28 (norgestrel and ethinyl estradiol) Tablets and 14 lots of Norgestrel and Ethinyl Estradiol Tablets (generic) have been recalled by Pfizer. If you have these pills, you must begin using another form of birth control immediately. 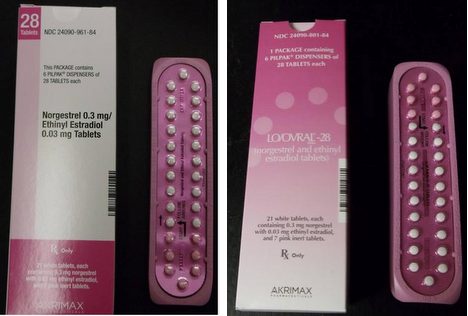 As a result of Pfizer's packaging error, the daily regimen for these lots of birth control pills (listed above) could be incorrect and leave women without adequate contraception. In other words, although the packaging defects do not pose any health risks, consumers using these birth control pills could be at risk for unintended pregnancy. Women who have used pills with any of the recalled lots should begin using a non-hormonal form of contraception immediately, notify their doctor and return the pills to the pharmacy. The recalled birth control pills were manufactured and packaged by Pfizer Inc., but also were sold as generics under the private label Akrimax Pharmaceuticals. The pills were distributed to warehouses, clinics and retail pharmacies throughout the United States. Concerned consumers can contact Grace Ann Arnold with Pfizer at 1-877-509-3935.